$99.99 plus free ground shipping anywhere is the US. Safely and easily Jump-Start your car, truck or powersports vehicles. SPORT has 150 Amps starting current with 300 Amps Peak. It can start a V8 up to 20X on a single charge! Jump-start vehicles with gas engine size up to 5 liter V8. (1995 and later model non-modified V8 motors up to 350 cubic inches in size.) The included Smart Clamps have a sturdy design with strong pivot points. They also feature multiple built-in protections. Conveniently Charge & Power your devices. The SPORT has great capacity for back-up power: 7500 mAh! It has a 5V 2A USB port to quickly charge most of your USB-powered electronics (Smartphones, Tablets, Cameras, PSPs, MP3 Players, Bluetooth devices and more). 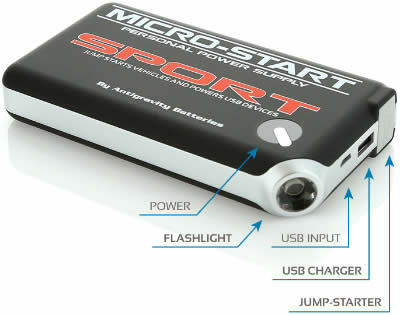 As the most compact Micro-Start kit available, SPORT is the perfect travel companion to supply back-up power everywhere you go. To assist in lighting your way in dark places or at night, the SPORT also features a bright LED Flashlight. It has 3 modes: steady beam, strobe pattern, and SOS flash pattern – cycle through with the press of a button. Mini, durable Jump-Starting Clamps. Multiple Safety Protections. Charging Tips: Mini USB, Micro USB, Apple 8-pin, Apple 30-pin. Top Quality design throughout, starting with UL-listed lithium battery cells. Automatic power-off when not in use. Carry Case is made of durable Nylon material and has mesh pockets with elastic openings to neatly organize all parts.